As a little girl Prachi Chaudhari dreamed of what a snowy winter day in Mumbai would look like. 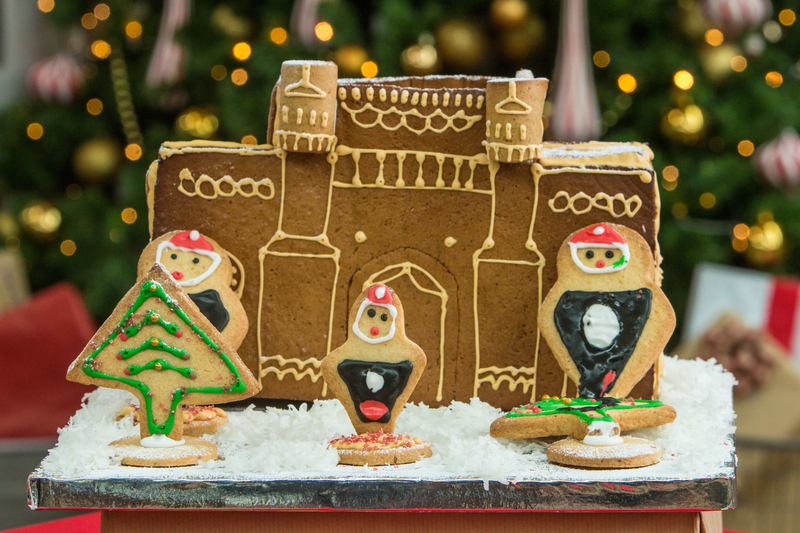 Based on her imagination she makes her Gateway of India recipe, using gingerbread cookies and lime sugar cookies, for her showstopper bake. Mary Berry and Johnny Iuzzini are pleasantly surprised by the inspiration for this bake. Watch the full "Cookie Week" episode from season two episode 2 of The Great American Baking Show to see if Prachi's 3-D Gateway of India recipe, penguins, trees and all earn her star baker. 2. In a small cup whisk egg. 3. Cream butter with sugars in mixing bowl of stand mixer with paddle attachment, until mixture is light and fluffy. 4. Add beaten egg and whisk for beat for 30 secs. 5. Gradually in 3 additions add flour with key lime juice and zest. 7. Remove the dough into large bowl and knead for 30 secs. 8. Wrap in saran wrap and chill for at least 40 mins. 9. Remove from fridge, roll out thin between 2 sheets of parchment paper, use templates and cut with a sharp knife. 10. Transfer the sheets on baking tray and let it chill for 10 mins in freezer. 12. Let cookies cool on wire rack before assembling or decorating. 1. Clean mixing bowl of stand mixer with vinegar and clean it with kitchen towel. 3. In to stand mixer's bowl with a hand whisk, mix meringue powder, lemon juice and warm water until frothy, add cream of tartar, mix well. 4. To this add all the confectioners sugar, use paddle attachment on lowest speed setting and beat for 3-4 mins, add vanilla extract and beat for another 5-6 mins, scrape and beat again until stiff and smooth.